Olivier Greif was born in Paris in 1950, his father was a Polish Jew who survived Auschwitz. 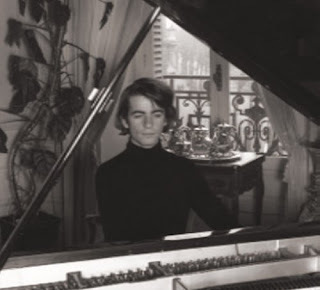 Greif's musical talent was identified when he was three and he entered the Paris Conservatoire aged ten to study piano and composition. He went on to study composition with Luciano Berio in New York where he moved in the same circles as Salvador Dali, Mick Jagger, Andy Warhol and Leonard Bernstein. All the accompanying photos, with the exception of my header montage, come via the Olivier Greif website and include shots of Greif with Dali and Bernstein. 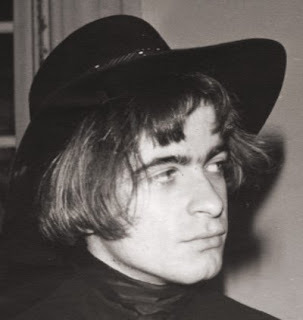 In 1970 Olivier Greif was appointed Luciano Berio’s assistant at the Santa Fe Opera and started exploring the music of West Coast composers including Terry Riley and La Monte Young. 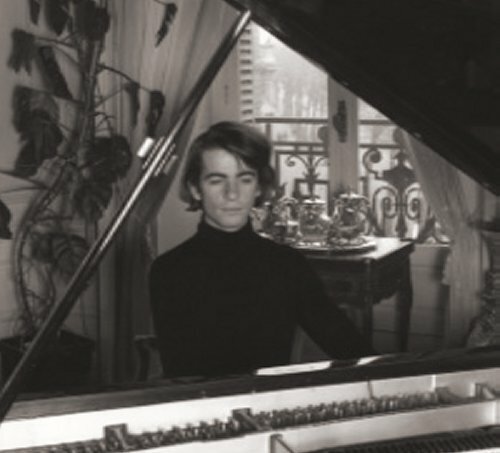 Despite his eclectic musical tastes Greif rejected serialism and electronics and instead developed a unique style influenced by Britten and Shostakovich, and he made a now deleted commercial recording of Britten's piano music. Greif's compositions can be divided into two periods. 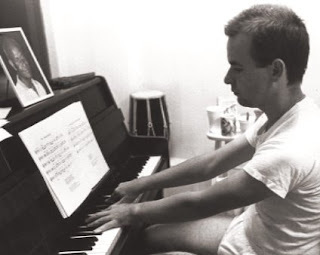 1961 to 1981 was the period when he developed his own voice as a composer. Then came a ten year creative hiatus which ended in 1991 with a series of darker and more intense pieces by the experiences of his father and other members of his family in the death camps. In later years his music became more experimental and in 1981 his chamber opera Nô was premiered in the Centre Pompidou in Paris, a performance given in collaboration with IRCAM with Olivier Messiaen, who mentored Greif, and Pierre Boulez in the audience. 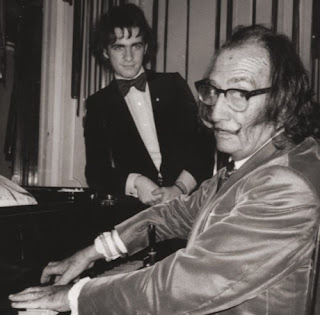 After two serious illnesses Olivier Greif was found dead seated at his piano in his apartment in Paris on Friday, May 13, 2000. The autopsy could not identify the cause of death but established that he had been dead for several days when found. He is buried in the Montparnasse Cemetery. Today Olivier Greif is a forgotten figure, although, fortunately, he remains represented in the CD catalogue. At which point the reader can be forgiven for expecting a plea for Greif's music to be more widely programmed or a heads up for a new recording of his music coupled with a plug for an upcoming concert. But conventional narratives do not interest me, so instead we turn to the little known story of the composer's ten year creative hiatus. 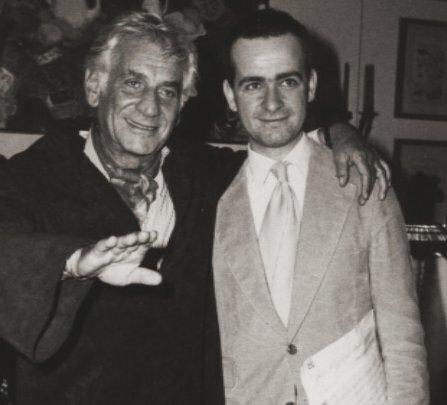 In 1976 Olivier Greif begins a spiritual quest with Sri Chinmoy and two years later he took the new first name Haridas, which means “God’s servant” and my header montage shows the composer on the left with his teacher. Sri Chinmoy was an Indian spiritual teacher, poet, artist and athlete who moved to the U.S. in 1964. He was the founder of the Sri Chinmoy Centre organisation and was a prolific composer of sacred music, mainly songs in Bengali and English. Sri Chimnoy advocated "self-transcendence" by expanding one's consciousness to conquer the mind's perceived limitations. Among his followers were Mikhail Gorbachev, Roberta Flack, Olympic gold-medalist Carl Lewis, John McLaughlin and Carlos Santana. McLaughlin's Mahavishnu Orchestra takes its name from the spiritual moniker given to him by Sri Chinmoy. In the photo below a picture of Chinmoy can be seen on Greif's piano. 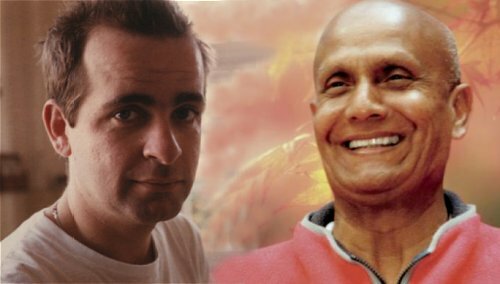 In April 1970, Sri Chinmoy was invited by UN Secretary-General U Thant to give twice-weekly meditations at the United Nations and in 1994 he received, jointly with Martin Luther King’s wife Coretta Scott King, the ‘Mahatma Gandhi Universal Harmony Award’ from the American branch of an Indian cultural institute. But inevitably Sri Chinmoy's activities generated controversy. In a Rolling Stone interview Carlos Santana said his guru was "vindictive" when they split and also alleges homophobia. In 2009 Jayanti Tamm published her best selling book of life as a Chinmoy disciple 'Cartwheels in a Sari: A Memoir of Growing Up Cult' in which she documents his "masterful tactics of manipulation", and elsewhere there have been allegations of sexual misconduct. Sri Chinmoy died in 2007, the Independent's obituary described him as "spiritual leader and peace activist" and Philip Glass and Ravi Shankar were among those who paid tribute to him. 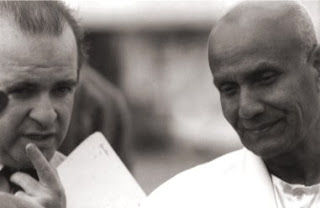 During the 1980s Olivier Greif, or rather Haridas Greif, became the face of Sri Shinmoy in France. He curated conferences on meditation and opened a book store on the Boulevard Saint-Germain devoted to his guru. In 1979 he premiered his settings of Three poems of Sri Chinmoy for voice and piano and he also appeared on an LP of Chinmoy's music with the New Light Ensemble. The photo above shows Olivier Greif with Sri Chinmoy circa 1995, but during the final years of his life Greif moved away from his spiritual master and reverted to his given first name. Probably his best known work, his Sonate de Requiem (1979-1983) dates from the years of his involvement with Sri Chinmoy. In his own note Greif describes the single movement work as a dedication on death seen from three viewpoints: death as a departure, death as a journey away from the earthly regions through successive planes of consciousness, and death as contemplation as the soul meets with the Source. Just as empathy with Cardinal Newman is not required to appreciate Elgar's Dream of Gerontius, so empathy with Sri Chinmoy is not required to appreciate Olivier Greif's Sonate de Requiem. The composer's dalliance with celebrities and an Indian mystic is just a fascinating sideshow to the main event - his music. There is a catalogue of Greif's three hundred and thirty one compositions here. It includes an incomplete Symphony No. 1 for solo voice, male chorus and orchestra 'Hiroshima' dating from 1994 which which sets testimonies of survivors of Hiroshima in English and the Bhagavad Gita in Sanskrit, and a Little Black Mass (1980) which combines the sacred liturgy with popular American songs. 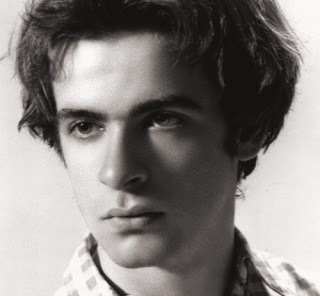 For those interested in further exploration the Olivier Greif website has a discography. A number of the listed releases are now deleted, but available and recommended are the Sonate de Requiem and Trio on Harmonia Mundi and the Battle of Agincourt for two cellos coupled with his Second String Quartet, which sets Shakespeare sonnets for baritone, on Zig Zag Territoires. Image credits official Olivier Greif website except header montage. 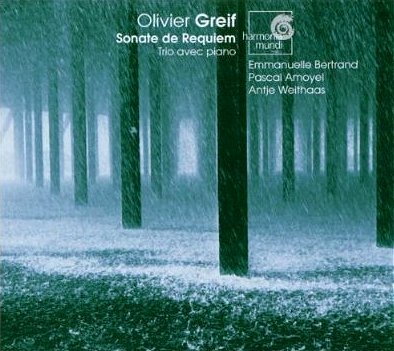 I discovered Olivier Greif's music when I bought the Harmonia Mundi disc of his Sonate de Requiem in an independent book/music store in Cluny when it was first released. This was on my first visit to Taizé and southern Burgundy abounds in thin places - the Temple of a Thousand Buddhas is also nearby. Any copyrighted material on these pages is included as "fair use", for the purpose of study, review or critical analysis only, and will be removed at the request of copyright owner(s). Report broken links, missing images and errors to - overgrownpath at hotmail dot co dot uk Also on Facebook and Twitter. Thank you for this fascinating post. I'll have to investigate Greif further. Fascinating composer with some very interesting compositions. I'm going to need to explore Greif's music much further, many thanks! You really are amazing, Pliable. Mike, thanks. But I rather feel it is classical music that is amazing, not me.